This is a story about Sassy Pants, a pig living on Farmer White's farm after World War II as told by Ms. Molly Merino, a wee shy lamb. Before she was reformed, Sassy Pants broke every rule of the barnyard, leaving her with no friends. Ms. Molly’s story illustrated the consequences of Sassy Pants’ bad choices and encouraged everyone to think carefully about the choices they make. The consequence for Sassy Pants was that she had no friends and was very sad. Ms. Molly tells the children how Old Clyde, the Clydesdale horse, discovered Sassy Pants all alone, her eyes red from crying. 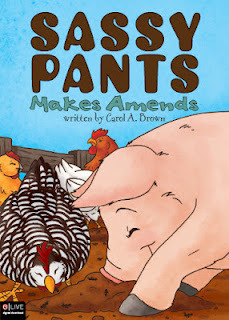 When Clyde learned why Sassy Pants was so sad, he told her she needed to make amends. Sassy Pants didn't know what that meant, but she was willing to learn. The story gently teaches us the big words. 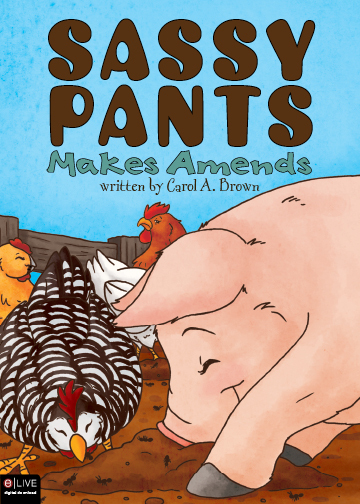 Sassy Pants goes back to all the animal friends she had hurt to try to regain their trust and friendship, offering the reader, or listener, many important messages. The animal characters are fun, too. I received a complimentary copy of this book for review from the author. I was not required to write a positive review. The opinions I have expressed are my own. I am disclosing this in accordance with the Federal Trade Commission's 16 CFR, Part 255.